My choice this week is to highlight an artist who was indeed highly prolific. Marc Chagall lived a long life (1887 – 1985) and his entry in wikipedia is huge. He not only produced lots of paintings but his work extends to a quite astonishing number of different media. And a great deal of it is displayed for all to see, not just squirrelled away by collectors, or hidden in the vaults of museums. 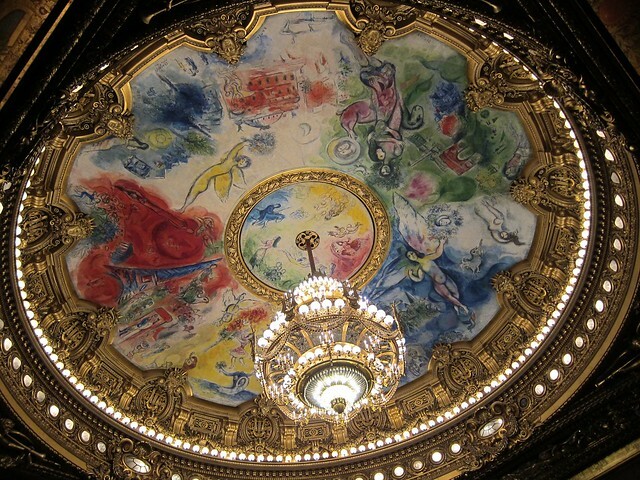 This is the ceiling of the Paris Opera (Palais Garnier) commissioned in 1963. 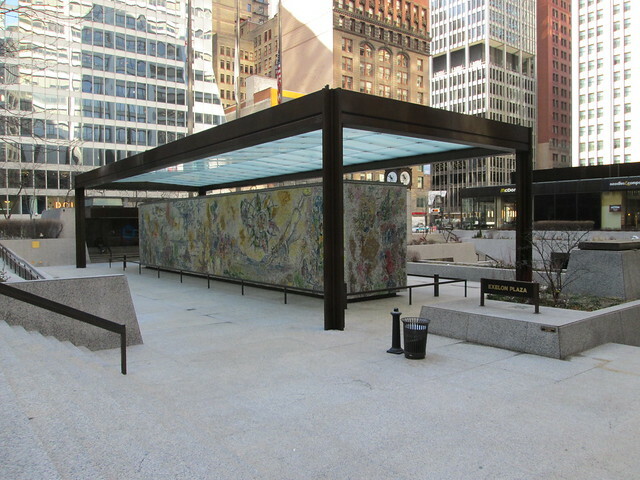 “The Four Seasons” is a ceramic mosaic on four sides of this huge block of concrete in Chicago. And we have only lightly touched the surface of his oeuvre. Looking at the photos posted by others, it dawned on me that the map was if not unreliable perhaps a work in progress. So I set out again to cover the gaps. And, once again, a number of murals were incapable of being captured into one shot so I have been doing some stitching again. These images are all on the flickr album and the Mural Festival site is also being updated with much more information, some of which I have copied here and to flickr. 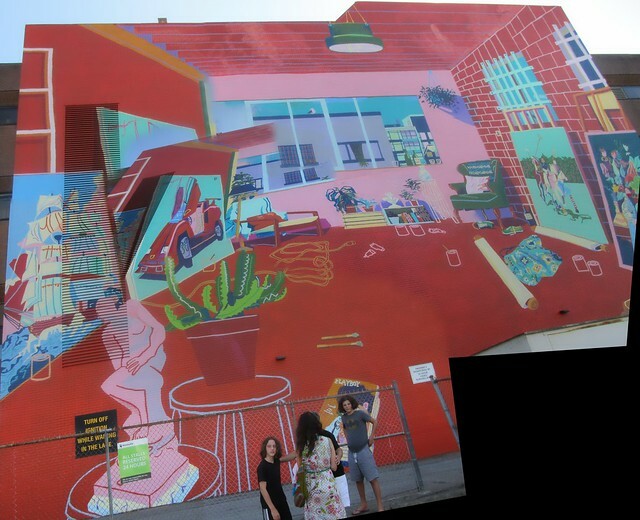 Artist Statement: The mural explores aspects if the human experience. Signs and symbols, patterns and forms that attempt to communicate a universal language. Inspired by board games and hieroglyphics, my mural works create a visual space to visually negotiate, a collection of separate parts that connect and can be read in multiple directions. The content is full on bold colour forms, a collision of shapes, some recognisable, some more ambiguous. This mural is an exploration of water, as illustrated by artists and musican Jenny Ritter. Imagery includes, swimming, boats, creatures etc. Using a monochrome palette of blues, members of the community painted the mural using a paint by numbers technique. In this piece, we depict to arms reaching from both ends of the mural. In the middle, we have two stationary vehicles waiting at the light. On the left, we see a large arm and hand holding a wheel entering the scene to help fix a broken black car. The left black car has opened up like a Russian doll to reveal a rabbit character sitting on a bicycle. In a similar fashion, the right side depicts a yellow car held by a giant hand. The yellow car also reveals a rabbit sitting on a bicycle inside. 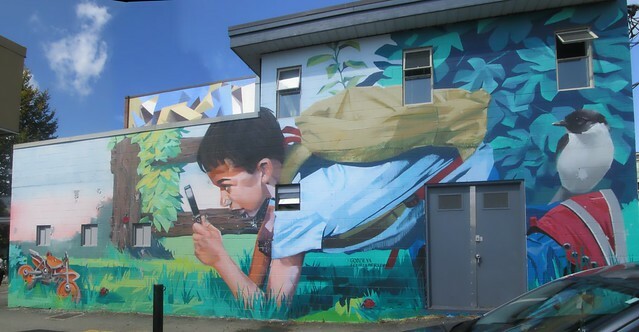 The concept behind this mural is based on a fun portrayal the modern commuter’s psyche in Vancouver. We are often faced with the dilemma of whether we should drive or cycle to our destination, but deep down we are often caught longing to be riding freely on our bicycles. This piece will hopefully help remind us to break out of our reliance on cars and ride our bicycles as free as wild rabbits. 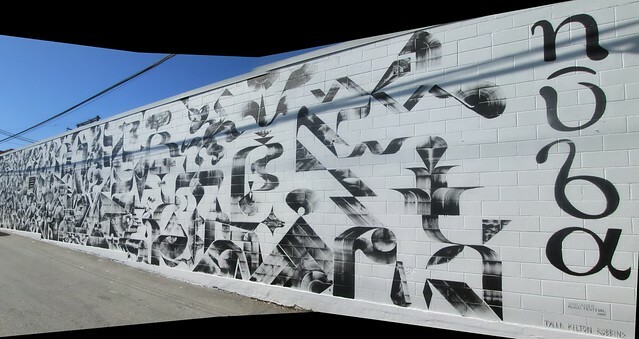 This mural is generously supported by Native Shoes. The last two sites are remote from the others, in the industrial port area around the Cordova diversion. Stace Forand tattoos at the Steveston Tattoo Company, with a focus on contemporary Japanese art. The northern end of Main Street at Industrial Avenue plus the Red Truck Brewery. There are seven more murals at Makerlabs, 780 East Cordova which are now covered in part 3. I have also now made up for missing half of the murals at Belvedere Court which is the large bottom image in the mosaic as well as the featured image (The Present). The festival ran from August 7 to 12 but, of course, the murals themselves will last a lot longer than that. Thinking to avoid the crowds, I went out the day after the festival events were over, but there were still plenty of people out taking pictures. Other blogs are already ahead of me with their postings and so far I have only covered those near Main Street from 14th to 4th. There’s a lot more to come but to get a taste of what else is out there see Ken Ohrn’s series on Price Tags. His pictures show many of the murals being created. Check out the festival’s page for artist details and so on – I have added a copy of their map at the bottom of this post. And only in that last one was I unable to get a clear shot without people. I do not understand why so many were getting themselves photographed in front of the murals. This last one is on the Hoot Suite building. There are now three further posts that cover the murals not shown in this one. There is also a flickr album of all of these pictures, which are downloadable at their original size and covered by a Creative Commons license. Yesterday I posted a collage of Trastevere in Rome. I mentioned that we had found the Villa Farnesina closed – so we had to go back. These are some of the pictures I took of the famous frescoes in the villa. Warning to those who may be in a highly puritanical workplace – some of these images may not be safe for work. A new exhibit opens at the Vancouver Art Gallery today entitled “Monet’s Secret Garden” – here’s the Courier’s review. The first thought that crossed my mind was that there is not much secret about his garden. It’s in Giverny, Normandy and is about 45 minutes on the train from Paris, and is one of the most popular of the sites we visited back in 2012. Both the house and garden are open to the public and even in May it was crowded. Even so, very much worth the time. We also saw his paintings at the Marmottan and in the huge galleries off the Tuileries. I did put up a small album of some of my favorite shots on flickr, but I thought that this would be a good excuse to publish some of the others.